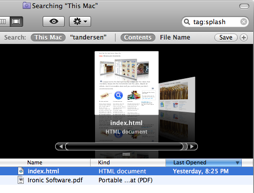 Tagit was a product that predated the Apple based tagging system introduced in macOS 10.9. It is discontinued. To tag a file – just drag it onto the Tagit application in the dock. You can also assign ratings. Tagit lets you drag multiple documents to it at once. 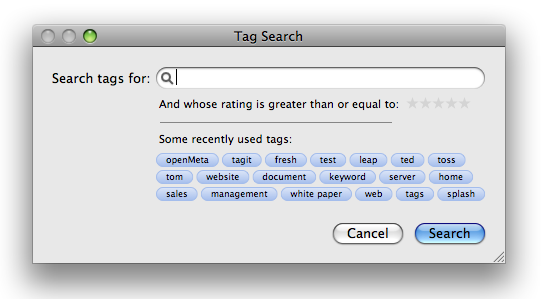 With multiple documents, Tagit will add tags to all the documents, leaving individual tags on specific documents alone. Which is just what you expect and need. Your most recently set tags are easily added with a single click. Two word tags can be made with the quote character (“New York”), or you can use the Space Bar and separate tags with commas with a trip to the preferences. You need to drag a file (or a group of files) to Tagit in the dock to tag files. In order to search for documents with a specific tag or rating, simply click on Tagit in the dock. A handy search window helps you pick tags and or a minimum rating to search for. 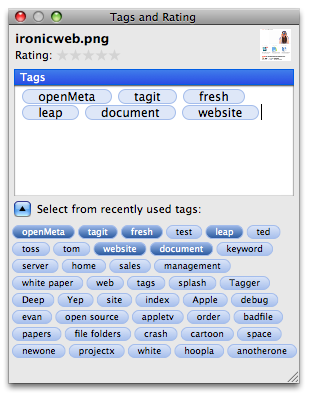 After you use the search feature a few times you can see how easy it is to search for tagged files without even starting Tagit – you simply type a search like ‘tag:splash’ into the Spotlight search window on your computer. 1.1 – Changed UI look. Fixed bugs in recent tags shown. Major bug fixed where editing files with Adobe products would sometimes lose tags. 1.1.1 – Added more support for Adobe xattr removing bug, updated to latest OpenMeta code. 1.1.2 – Fixed problem where recent tags were not updated. 1.2.0 – Fixed ratings search on 10.6. Updated tagging for 10.6. 1.2.1 – Fixed small problem with updating tags. 1.2.3 – Added nicer icon, also updated for latest OpenMeta and 10.6 versions. 1.3.0 – Updated for latest 10.7, 64bit, OpenMeta, now requires 10.6. 1.4.1 – Fixed problem with two word tagging tip overlapping a button, and a warning in the console. 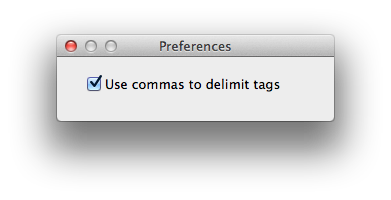 1.4.2 – Added option in prefs to use commas to separate tags. 1.5.1 – Uses new Mavericks tagging on Mavericks, while maintaining compatible tags for 10.7 and 10.8 users.